The author will look at the role of Toronto in Canadian history. It should be remembered that Toronto has undergone a massive “identity shift” over the last five decades of Canadian history. 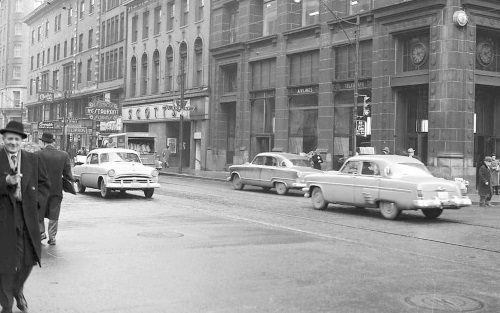 In the 1950s and before, the city was considered as so conservative and British-oriented that it was nicknamed “Tory Toronto”. Indeed, it was snidely said of those times, that on Sunday, you could fire a cannon down Toronto’s main street and not hit anyone (because everybody was at church)! In the 1960s and later a vast roaring tide of change engulfed and massively transformed the city. Ironically, much earlier in Canada’s history, during the 1920s and 1930s, there was the opposition between “Tory Toronto” and the Prairie provinces, where there was the electoral insurgency of the Progressive Party. In 1942, the Conservative Party was renamed “Progressive Conservative” – in the hopes of attracting many supporters of the former Progressives. However, it was also a highly convenient name in a society that was becoming increasingly liberal-tending. Indeed, it could be argued that since the 1980s, the tide of change has increasingly overwhelmed the city of Toronto and its surrounding suburbs and environs. Ontario, the most populous province in Canada, is also clearly the wealthiest. Ontario now holds around a third of the seats in the federal Parliament -- with its vast megapolitan node and power-centre for all of Canada, Greater Toronto, with all its endless suburbs and environs. It may be noted that in one of the 1987 Statistics Canada reports, Metropolitan Toronto had an unemployment rate of 3.9% -- while most economists consider a rate of 4% as full employment. During the 1980s, Ontario consistently had unemployment rates at least 2 percentage points below the national average. It may be noted that considerable parts of Ontario itself tend to hate Toronto, and that the Toronto “arts cliques” also loathe what is called “small-town and rural Ontario.” The so-called rural Ontario is seen as the main base of the Conservatives both federally and provincially – the core areas where both Stephen Harper and Mike Harris have drawn their support. Indeed, at the height of the conflict between Mike Harris’ Tories – who were frequently characterized as “hard right” – and the larger urban centres of Ontario – especially Metropolitan Toronto – there were some tendencies afoot that wanted Metropolitan Toronto to secede from the province of Ontario. It was thought that the interests and needs of Ontario and Metropolitan Toronto were so divergent that only the creation of an “eleventh province” in Metropolitan Toronto could assuage them. Of course, it is not surprising that some of the most powerful infrastructures of the socialist New Democratic Party (and, to some extent, of the Liberal Party) exist in the municipal bureaucracies of large-urban centres – most especially in the new City of Toronto (formerly Metropolitan Toronto). Ironically, what weakened Harris the most in the “416” zone was probably powerful cadres of highly motivated and effective WASP opponents in the media, intellectual, and cultural elites – who energized the vote of the various “recognized minorities” against him. In the 2010 municipal election, other “neighbourhood cleavages” appeared within the new City of Toronto -- reflecting the former divisions within the old Metropolitan Toronto. What was the former, smaller “City of Toronto” within Metropolitan Toronto – mostly the downtown areas – voted against the right-leaning Rob Ford – whereas the outlying areas – notably, Etobicoke, North York, and Scarborough, voted for him. Rob Ford won the municipal election. The Toronto “arts cliques” now directed some of their resentment at the outlying neighbourhoods of the old Metropolitan Toronto. However, in the 2014 provincial election, virtually the entire GTA elected Liberals – thus giving Premier Wynne a majority of seats in the provincial parliament. In that election, it is somewhat disconcerting to see the territorial imbalance between the Liberal and Tory-held ridings in Ontario – the Liberals elected virtually no one outside the GTA and Ottawa. Now that there is a Progressive Conservative majority government under Doug Ford, there is talk again of Toronto seceding from Ontario. The frequently more “progressive” nature of large-urban centres is also seen in the nickname of Edmonton – “Redmonton”. In Alberta, it is usually deployed as a term of criticism.